So spoke William Leadbeater, a local ‘operative’, (his occupation is not recorded), at a meeting in Huddersfield in 1830. We may laugh, at the hyperbole, as did those at the meeting, but this quote illustrates a couple of vital points. Firstly and obviously, that hostility to machinery remained long after 1812. But the main point lies in consideration of the context in which it was made. This was a meeting on distress in Huddersfield following the 1826 bank crash. And this was not the only reference at this time to machinery being a primary factor responsible for unemployment and poverty. The Operatives Committee behind these meetings was composed mainly of handloom weavers, particularly the fancy weavers of Almondbury. Out of such meetings grew the local Political Unions for parliamentary reform, which in the 1830s dovetailed both with trade unionism and with that of the Factory Reform movement, one of the main aims of which, articulated both by radicals and ‘radical Tories’ like Oastler, was preservation of the domestic system of production. Although by now most of the weavers in that sector, particularly in the fancy trade, were proletarianised wage workers. Therefore, the machinery question, the defence of domestic manufacture and political struggle were all clearly interlinked right through to the Chartist 1840s. This is from a decade before 1812. It is in the report which was passed on to the authorities of a meeting in Almondbury in 1802 of suspected United Britons, a Jacobin cell. There is clear evidence of Republican activity in the area and no reason to disbelieve that one of the concerns of this group was the impact of machinery. After all, in parts of France machine breaking was part of the revolutionary movement. But the machinery question was not just a concern of a small group of clandestine Jacobins. In the 1807 Yorkshire county elections the defence of domestic production, machinery and the apprenticeship question was the concern of many of the small freeholders. It contributed, if was not the main factor, in the defeat of Henry Lascelles. Lascelles was the chair of the parliamentary committee in 1806, which found that the domestic woollen industry would not be adversely affected by the repeal of the ancient laws regulating it. William Wilberforce, who was also on the Committee, was elected, but he had not exhibited the same vociferous hostility to the clothiers and cloth dressers as Lascelles. This committee in its report appeared more concerned about the subversive threat from the ‘Institutions’, the organisations representing the clothiers and cloth dressers, than about the threat to domestic manufacture from machinery. Clearly, both prior to the outbreak of Luddism in the West Riding in 1812, and for a long time afterwards, the machinery question was inseparable from resistance to the factory and defence of the domestic system as a whole. And this resistance implicitly, and often explicitly, had a political dimension. By political activity I do not simply mean that people were drawing up political programmes expressing their grievances, or were engaged in activities intended to influence or change the parliamentary system. This paper does not consider the wider political concerns of the croppers, such as parliamentary reform and the movement to end the war with France. Nor does it look at their role in elections as enfranchised freeholders, or as non-electors who could at least shout and perhaps kick up a riot. By political I mean that they were forced into a position of responding to and resisting increasing state repression. This was a state that was shaped by the need to push forward industrialisation at home and to maintain Britain’s commercial predominance abroad, as manifested in the war with France. This was not a remote state apparatus. It was evident on a daily basis in the organisation of the Volunteers in 1794, against not only invasion but ‘intestine commotion’. It was evident in the role of the local magistrates, who since the Combination Acts of 1799-1800 had a direct role in suppressing illegal combinations. And it was increasingly evident in the realisation that parliament was clearly on the side of the manufacturers regarding the machinery question. The armed, the judicial and the legislative arms of the state clearly revealed their class bias, nationally and locally. Did the active element of the croppers, the occupational group out of which WR Luddism grew realise this? Were they politically conscious in this respect? The first opposition to gig mills in the West Riding was apparently an attempt to invoke ancient Tudor legislation prohibiting this machine in order to prosecute the Atkinsons of Bradley Mill in 1787. Whether there was any organisation behind this legal initiative is not recorded. According to the Halifax cropper, John Tate, speaking before the 1806 Select Committee on Woollen manufacture, the croppers organisation known as the Institution dated from 1796. In 1799, as a result of the Combination Act, the Huddersfield cloth dressers society, which was presumably the local form of the Institution, was dissolved and its funds disbursed. It called in over 500 membership tickets. The Institution reformed as a sick brief Institution, ostensibly a friendly society concerned with relieving members in distress. Tate claimed that unlike its predecessor it did not have a Bank of funds, although the suspicion that it did was one of the main concerns of the authorities. It was also an oath-bound society, always grounds for suspicion. Whatever the role of the Institution at this time its’ activities were certainly circumscribed by the Combination Acts. But the limitations of these Acts were shown by the willingness of some croppers to use direct action to resist machinery. In November 1799 Johnson’s gig mill at Holbeck was destroyed. The description of the event by the merchant and magistrate William Cookson prefigures later Luddite attacks. ‘many hundreds were present and some disguised, …and though a considerable reward was offered from the government and from the magistrates, and the parties were summoned up who were known to be there, and who could not prove an alibi, no argument or entreaty could prevail upon anyone to confess who were active parties in the business’. (1806). Similarly, in the West of England disturbances of 1802, a semi clandestine Institution employing strike tactics co-existed with a movement employing direct attacks on the mills housing shear frames. This Institution was clearly linked with the one in the West Riding. Delegates moved between the two areas. The same membership ticket was used showing the Leeds coat of arms and crossed shears and no shearman from the West of England, or West Riding cropper could get work in either area without one. In the West Riding, where each town had its own committee and sent delegates to central meetings at the White Swan at Birstal, 1802 saw strikes against the gig mill, the employment of non Institution men and the employment of over age apprentices at Huddersfield and Leeds. This had some success since Cookson asked merchants to desist from installing machinery through fear it would lead to ‘horrid outrages’. Fitzwilliam, the Lord Lieutenant, wrote to the Home Office denouncing the ‘system of terror’ and describing the croppers as ‘the tyrants of the country, their power and influence has grown out of their high wages, which enable them to make deposits that puts them beyond all fear of inconvenience for misconduct.’ The powerful closed shop of the croppers had clearly back footed the authorities. Because of the Institution, Benjamin Gott, the merchant and owner of the largest woollen factory in Leeds, was unable to recruit strike breakers in Trowbridge. But the resistance was not just from the croppers. In 1803 the Rules and Orders of the Clothiers Community, Leeds, established a ‘clothiers brief institution’, in defence of 7 year apprenticeships. Behind that, of course, was desire to protect the domestic system of production as a whole. As one clothier put it in 1805 they were opposed to the ‘mighty factories …erected … by these monopolisers.’, wealthy manufacturers and merchants, who were setting up loom shops in their premises. As well as displacing independent clothiers the factory system was held to produce all sorts of baneful moral effects detrimental to the community. In Leeds in 1805 and 1806 there were numerous strikes both by weavers and other workmen, including shoemakers, tailors, joiners and cabinet makers, bricklayers and flax dressers. In January 1805 five shoemakers were sentenced to 3 months in York for illegal combination. In May in Wortley weavers and spinners were discharged in order to break up the ‘institution formed among themselves for the purpose of relieving each other when sick.’  While in Farnley, two clothiers were convicted of illegal combination. In 1805 the merchants and manufacturers of the West Riding had formed a combination of their own. In Leeds 54 firms signed a resolution not to employ any Institution men. Joseph Stancliffe, a clothier, of Hopton, in evidence to the 1806 inquiry, thought that the decision not to employ Institution weavers, ‘has in some measure prevented them.’ But it lead to a bitter dispute. Non Institution men were referred to as ‘snakes’ and homes were attacked in Beeston,Wortley and Armley. Among the names of the 31 firms signing the Huddersfield resolution are many of those who also supported Lascelles in 1807  and who backed the creation of the Volunteer force. They include the Atkinsons and Horsfalls who were the most prominent advocates of finishing machinery. The class lines were clearly being drawn in this struggle. Although the main focus of the cloth dressers’ Institution was now on petitioning parliament against the repeal of the old laws regulating gig mills and apprenticeships, they still had enough funds to offer support to other workers. On this point their representatives before the 1806 select committee were intensely interrogated. Payments also included an allowance to Mrs Hilleker, mother of Thomas Hilleker, hung for his alleged part in the burning of Littleton Mill in Wiltshire in 1802. ‘this explanation far from satisfactory and strongly to suggest the idea of a connection with some other transactions which had taken place not long before in the manufacturing district and in which from their nature the interests of all commercial men were deeply involved’. There is no doubt that, even among the Luddites too young to have lived through the experience of the Institution themselves, there must have existed an awareness of the political processes and personalities which had led to the impasse, to a situation where machinery could only be stopped by force. There is clear continuity in the struggle against machinery and the erosion of the domestic system both prior to 1812 and afterwards. I believe that the burden of proof is on those who assert that the Luddites were somehow quarantined from this culture of resistance. To Summarise. The cloth dressers and others whose lives and livelihood were bound up with the domestic system faced both increasing economic repression and political repression. There response was to resist, by legal channels when possible, but also by direct action. This resistance to machinery was both trans-regional, as is evident in the links with the West of England and trans-occupational, since opposition to machinery and the factory system came not just from croppers, but from the largest occupational group the clothiers, or domestic weavers. The croppers also had a history of strong organisation and of support for other workers. This is the milieu in which they lived and worked and which shaped their ideology. Much of the spilt ink and controversy about the nature of the Luddites has resulted from a failure to recognise this fact. The Luddites have been compartmentalised, pigeon holed, into simply a machine breaking movement. This predates any retreat from any analysis that appears to be a ‘grand narrative’, though this trend in historiography has created its own problems of obscurantism and confusion. It stems from a reluctance to see the Luddites as part of a wider class struggle. This is not just a fault of the right, some dogmatic Marxists also see Luddism as a reactionary movement, aimed at holding up the inevitable development of the productive forces. 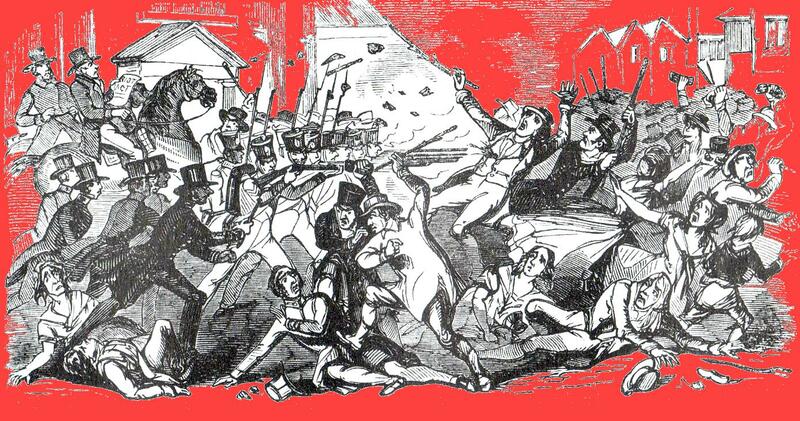 This is not to say that the WR Luddites in 1812 were champions of working class liberation or wanted a workers’ revolution, which is a counter-parody of Luddism sometimes voiced on the left, but nevertheless, their struggles were an integral part of the process of the making of the working class. In this, E P Thompson’s seminal work is as valid as ever, and 50 years on, I maintain, it has stood the test of time. Leeds Mercury 13 Mar 1830. William Stocks, ‘Report from the Committee on Commerce and manufacture’ Parliamentary Papers 1833 V! pp 597-637. Deposition of Mark Haigh 24 Aug 1802 Radcliffe MSS1 . [W]est [Y]orkshire [A]rchive [S]ervice,Leeds . Jeff Horn, ‘Understanding Crowd action, machine breaking in England and France. 1789-1817’, Proceedings of the Western Society for French History; . ‘Machine-breaking in England and France during the Age of Revolution Labour/Le Travail’, 55 | The History Cooperative. Robert Potter Berry, (Late) Lieutenant 6th West York Rifle Volunteers. A History Of The Formation And Development Of The Volunteer Infantry, From the Earliest Times, Illustrated By The Local Records Of Huddersfield And Its Vicinity, From 1794 to 1874, Officers of the Volunteers, helped the magistrate Joseph Radcliffe arrest three food rioters in Huddersfield in 1799. LM 1 Feb 1800. WYAS, Kirklees, Crossland & Fenton,solicitors’ papers KC 165/36 25 July 1787. John Robinson against Richard Atkinson at York assizes of Bradley Mill for contravening a law of Edward VI by finishing cloth with a gig mill. John Tate evidence ‘Report of and minutes of evidence taken before the Select Committee to Consider the State of the Woollen Manufacture’, Parliamentary Papers 1806 Vol 3 ; LM 7 Sep 1799. A Aspinall, The Early English Trade Unions, documenrts from the Home Office Papers in the Public Records Office, (London 1949); Kenneth G Ponting, The Woollen Industry of South West England, Bath 1971.Adrian Randall, Before the Luddites, custom, community and machinery in the English woollen industry, 1776-1809 (Cambridge 1991). LM 18 Jan 1806. See also Wm Child’s evidence 1806. Op.cit.